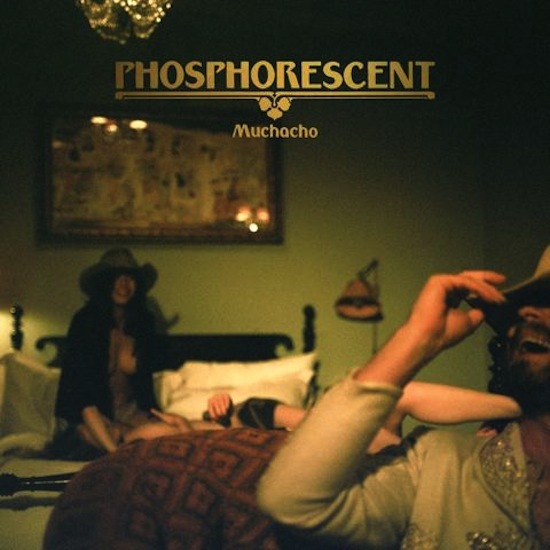 “Song For Zula,” the second track on Phosphorescent’s sixth album Muchacho, begins with a line cribbed from the Man in Black: “Some say love is a burning thing/ and it makes a fiery ring.” For those paying attention to Matthew Houck’s output up to this point, this shouldn’t come as that much of a surprise. In 2009, he released To Willie, an entire album of Willie Nelson covers. And Phosphorescent’s 2010 track “It’s Hard to Be Humble (When You’re From Alabama)” tipped its Stetson to Mac Davis. The man clearly knows his classic country. Yet “Song For Zula” isn’t actually a country song. It’s more atmospheric and open, with a skip of electronic beats and a powerful swell of violins. Its greatest connection to Nashville’s greats, rather, is its deep emotional core, with Houck offering poetic laments like “See the cage, it called/ Said ‘Come on in/ I will not open myself up this way again,’” even if, sonically, it’s something much dreamier and ambient. This, too, shouldn’t come out of left-field for those who have kept up with Houck’s catalog; for while his ragged, inimitable croon is constant, the songwriter himself is an artistic nomad, roaming new sonic territory with each new outing. As such, Muchacho never stays in one place for too long. Opening track “Sun, Arise! (An Invocation, An Introduction)” gives a brief glimpse back into the nebulous psychedelic hymns of 2007’s Pride before the album ushers in any number of thrilling detours out to Americana’s widest reaches. Both “Ride On/Right On” and “A Charm/A Blade” return to the upbeat countrypolitan romp style of 2010’s Here’s to Being Here, while “Muchacho’s Tune” takes a heartbreaking, dusty waltz and backs it up with an added buffer of glowing synth. Yet it’s moments like the convergence of lonesome lap steel and piano in “A New Anhedonia” are where Houck’s songwriting truly hits its stride, opening up to allow in enough space to let the stark melody ring with that much more potency. If there’s one song on Muchacho that can match the truly stunning “Song For Zula,” however, it’s “The Quotidian Beasts,” a seven-minute rock jam that utilizes the chord progression from Chris Isaak’s “Wicked Game” for the sake of a Crazy Horse-style dust-up. It’s earthy and gritty, almost a complete inverse of “Zula,” but these two standout tracks act as Houck’s yin and yang. He can do a tender, dreamy pop song, or he can plug in and just get straight to rocking. And anything in between is fair game.